Is a Sin Always Immoral? The point I like to make is that God punishes (eternal torture) for many sins which are not even immoral or criminal. Most sins are actually just things God doesn’t like (arguably not immoral), yet He is prepared to punish anyone for committing them. My go to example sin is non-belief in God, or atheism. Yes, simple, non-criminal, non-immoral, justified non-belief is enough to get you tossed into hellfire forever. An unwarranted punishment by any standard. Actually, punishment of any kind for most of the sins God dislikes is a GROSS overstep of ANY authority. The threat of such unwarranted punishment is blatantly immoral, criminal, tyrannical coercion. It is the Mob Boss maiming you for not wanting to pay his “protection” fee. The believer is conditioned to argue that nonbelievers are choosing hell, but this equates to the Mob Boss victim choosing to make the Boss punish unjustly. Yes, the Mob Boss (God) is the one acting unjustly and immorally. Nobody is making him punish unjustly except God himself. And no Mr believer, God’s supposed authority as a powerful creator doesn’t override any such immorality… unjust punishment is unjust punishment. Yes, your God is an immoral monster and you the blind believer excuse his actions. Below are about one quarter of the bible sins listed on amazingbible.org. I used the 1st page to make a point. I went through and noted any sin that truly seems immoral and potentially immoral, as well as those that didn’t. (Immoral meaning: outside society’s standards of acceptable, honest behavior, which may cause harm to others.) You might disagree with some, but only about 25% of what God tortures for could arguably warrant any punishment at all. The fact that they are ALL punishable by a higher power shows without a doubt that God is a tyrannical dictator. (Tyrannical: unjustly cruel, harsh, or severe; arbitrary or oppressive; despotic) There really is no doubt. To use this realization further, A tyrant is anything but all loving (or even a little loving) and this contradiction in the biblical God proves that this God can’t exist as claimed. Atheism is the justified position already, but absurdities like this make it that much easier to see. god’s existence doesn’t justify their belief at all. (B) Prophecy was fulfilled. Much prophecy in the bible is unverifiable as fulfilled beyond the Bible’s claim. Prophecy being fulfilled could simply be writers looking at the Old Testament promises and writing a story to fulfill them. Further, the old prophecies could simply be attempted to be fulfilled by normal folks pretending to be the one destined to fulfill them. Other prophecies were extremely vague or simple leaving the door open for any number of interpretations. EVEN if an amazingly impossible prophecy was verified to have come to pass, there is no verifying that a divine intelligence or power played any part. It would be a mystery. (C) Miracles in the Bible (and elsewhere). Water to wine, walking on water and the resurrection are unverifiable stories. Even if there was a verifiable witness to such events, they become mysteries, which are not by default answered by divinity. This also applies to modern miracles, visions, experiences and prayers. They are beyond explanation, beyond inspection, beyond revealing a source. It is a mystery and mysteries do not equal “God did it”. If you were to see a vision of The Faerie King, experience a powerful feeling and miracle with it, does this prove the Faerie King is real? Of course not. The images and events could be caused by forces you can’t see. They could be anything and inserting you god myth as the cause is baseless & fallacious. (E) The bible is inerrant. The first sentence in the bible “In the beginning God created the heavens and the Earth” doesn’t match reality. In the beginning the heavens (space and time) could be argued, but the Earth wasn’t formed until another 9 billion years of stuff happening had passed (NOT remotely the beginning). Yup the first sentence of the Bible brings into question its validity as a whole. This is just the tip of a massive iceberg. There are many flaws, errors and contradictions in the bible (a few examples HERE ) and many apologetics excusing them. But the fact that seemingly endless excuses are needed to explain such a flawed book, means its far from perfect in many ways. An inerrant book wouldn’t need excuses or favorable reinterpretation, it would be clear. (B) The big bang needed a push from something beyond time and space. Perhaps that first singularity did need an “external” kick-off and maybe it didn’t. We don’t know yet, since our science can’t observe the event. Believers often claim an uncaused cause had to start the ball rolling, which may be true, but claiming a yet unproven myth did it is an argument from ignorance. Your lack of imagination and information doesn’t mean you can default to your favorite myth to fill in the blank. Besides, you would need to disprove any natural uncaused causes, which may have been plentiful then. Or show such a compressed source of energy (energy which may have always existed) wouldn’t have its own laws of physics directing it to expand upon reaching a critical mass. Or refute omnipotent power slime, or the Faerie King or a million other imagined causes. Indeed such a mystery doesn’t prove your god exists. Not even close. 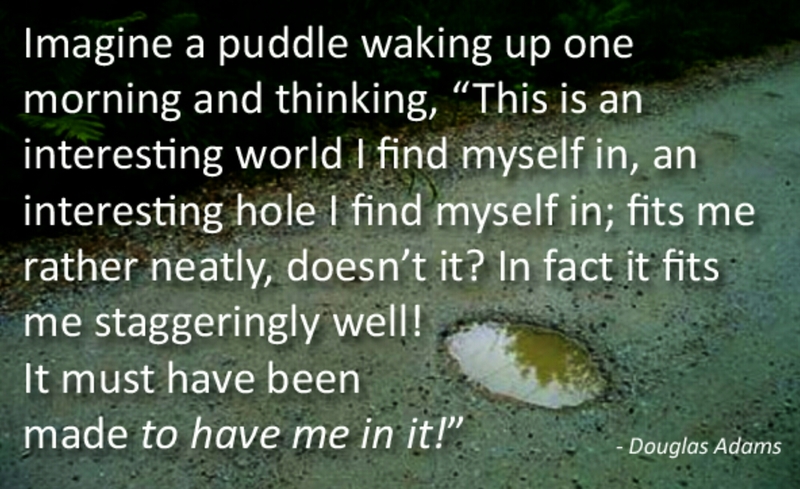 (D) Everything… all of nature proves god exists. Perhaps this is you looking at everything in awe and and not being able to understand how natural forces did all this. Or more likely since you have been told for so long tha your god myth has done it all, your auto conclusion fall to “God did it”. Either way, there isn’t evidence by merely observing nature and pondering. Your interpretation of nature isn’t evidence but just your subjective opinion. (A) It’s interesting to note that many arguments or questions for the existence of God often used by Christians are concepts of love, hope, beauty, etc. as if those notions contain a definitive trump card explaining God. The same correlations they desire between God and love are also true of sadness, fear, hatred and other negative human emotions. It seems to me that since the New Testament insists (either nonsensically or pantheistically) that, “God is love,” Christians think that if they can prove that love can’t be proved but it must exist, *somehow* God can’t be proved but he must exist. The logic in this assumption is obviously and horrendously flawed, but so many apologists who should know better, still use it! It reeks of intentional dishonesty. Science tells us about “love” and while love can’t be precisely measured or even precisely defined, it is still a very real emotion. We know that love exists, not just because we can witness it ourselves and see it expressed, but we know what chemicals in the brain cause it. Love is therefore clearly a function of the brain and has no external source. If you alter the brain enough, emergent properties like love, no longer function. (8) I have personally witnessed God, experienced Him first hand. (A) God appeared before me. My tesimony proves god. Saying that you recognized somebody who no human could recognize suggests a manifistation from your own brain. Also, there are many thousands of alien abductees who claim first hand experience with aliens and because of this extreme claim, with only their story, it is dismissed. Why would god/jesus appearing to anyone hold more weight? Sheer numbers? Gods and dogma are drilled into heads through potent indoctrination. Believers are desperate to find him. Its not a stretch to believe the human brain could manifest such desired experiences. (B) I’ve witnessed a miraculous event after praying. And you’ve prayed thousands of times with no results… even the opposite result. You probably pray so often that there is always a chance for a coincidence. You ignore all the failures and recall the close coincidences. However, lets say something amazing and even miraculous happened right after a prayer. You still saw no god doing anything. What DID happen is you used your brain… you willed this event to happen. It is far more apt to investigate some kind of advanced brain ability than a myth who played no apparent part. Think about it. Your first 2 paragraphs don’t directly address the challenge: To demonstrate that your God exist and has caused at least one event. Your first 2 paragraphs explain very well that the Bible says it’s so, but that is the Bible writers’ claims, opinions and fictions, not a demonstration with evidence. If you say “The Bible demonstrates itself true” then maybe you mean (1) eye-witness accounts? The later Gospels copied each other (adding variation) and the first was written (decades after Jesus supposedly died) mostly as a story being told via hearsay, not as an eye witness account. The bible notes many folks that saw Jesus and his miracles, but none are verifiable beyond bible claims. Or of the anonymous 500 seeing Jesus risen not one had their miraculous account recorded. No local historians or anyone else outside the bible narrative even noticed Jesus, or the eclipse or the dead rising from the graves. Or do you mean (2) prophecy was fulfilled, therefore it’s all true? Much prophecy in the bible is unverifiable as fulfilled beyond the Bible’s claim. Prophecy being fulfilled could simply be writers looking at the Old Testament promises and writing a story to fulfill them. Other prophecies were extremely vague or simple leaving the door open for any number of interpretations. Or do you mean (3) miracles in the Bible prove God is real? Water to wine, walking on water and the resurrection are unverifiable stories. Even if there was a verifiable witness to such events, they become mysteries, which are not by default answered by divinity. Or do you mean (4) historic accuracy proves the bible true? An accurate recounting of people, places and events is what makes fiction seem real. There’s no reason to believe the Bible writers didn’t just insert fictional people and events into their real background. Or do you mean (5) the bible is inerrant, proving it true? The first sentence in the bible “In the beginning God created the heavens and the Earth” doesn’t match reality. In the beginning the heavens (space and time) could be argued, but the Earth wasn’t formed until another 9 billion years of stuff happening had passed. Yup the first sentence of the Bible brings into question its validity. Per your 3rd paragraph you cite complexity of biology as evidence of God. Nature via evolution and natural forces is perfectly capable of creating complex processes and systems. If you wish to claim it’s not capable of this you need prove it’s not. Being in awe of complexity doesn’t allow for a fallacious leap to conclude your favorite myth, any myth or any unverifiable force was the cause. Even if we as humans couldn’t explain your biology examples, it becomes a mystery and mysteries don’t equal “god did it” by default. You would need to further demonstrate a link between the mystery and your yet unproven god. I’m happy you escaped from substance abuse, no matter how you did it! Yes, finding a positive guide when you are at rock bottom can get you back up. When I was 8 my grandmother died. I imagined my stuffed animals were suffering too, and they helped me through it by talking to me and comforting me. The fact is any new thing to latch onto can be a crutch to help you continue. I dropped my crutch, you didn’t. You traversing that harsh recovery doesn’t demonstrate a god, but rather trading an old dependence for a new one. Indeed getting clean can be done in many ways, none of which demonstrates the process to be more than an effective tool. I am clearly trying to have somebody prove God (or a god, or gods) in fact exists, not prove he doesn’t. 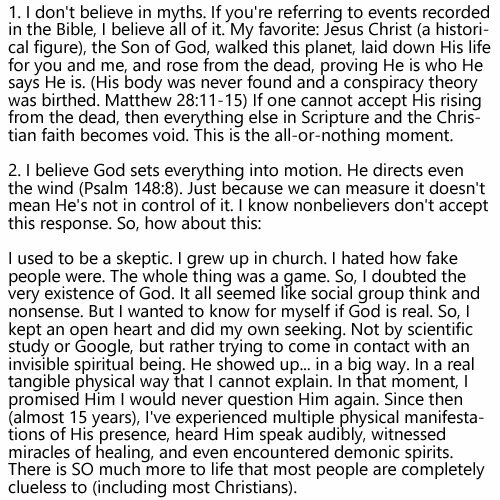 I challenge whether or not my own position “I don’t believe ‘gods exist’ is a fact”. 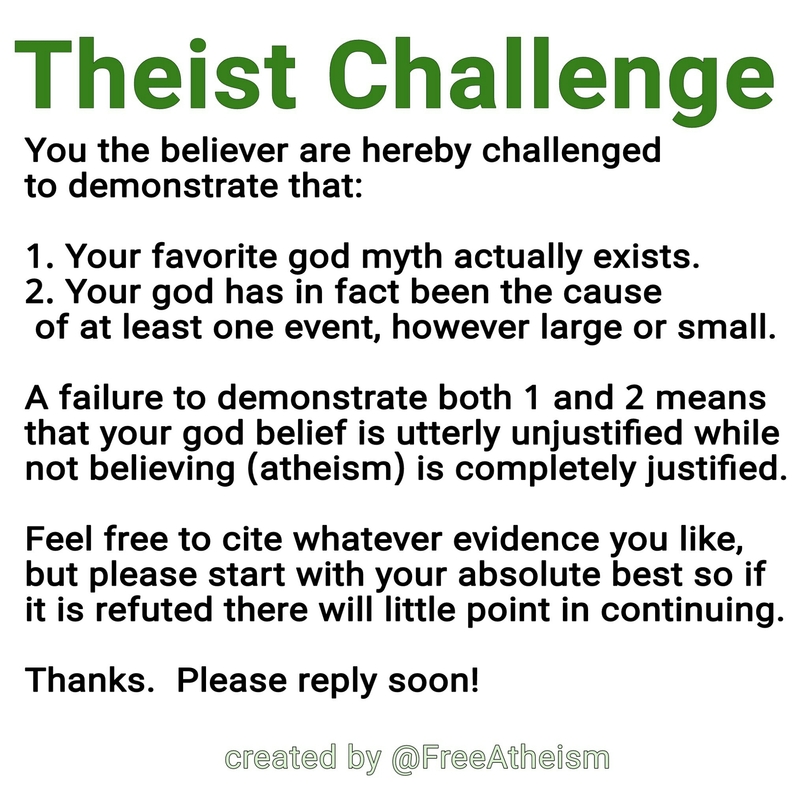 I don’t think any human knows gods do or don’t exist for sure, so by showing others they have no evidence to justify their belief, I justify my own position of not believing. I don’t say God doesn’t exist. It just doesn’t seem like he does, since no believers have evidence to show he does. I certainly don’t and can’t hate something which isn’t there, but I do challenge the harms of religion. ** So in conclusion, you have not demonstrated that God exists or that he has been he cause of even one event. At this point your belief that god exists remains unjustified, while not believing is both the rational and justified conclusion.